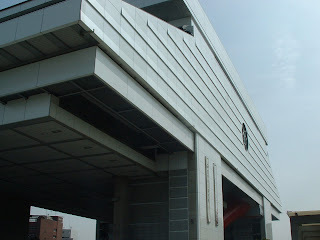 On Sunday, some of us went to the Edo-Tokyo museum (i.e., local history) in the morning. The first thing you notice about the building is that it's behind the building you assume is the museum (a big square building with a bright green roof). The next thing you notice is that it looks like an AT-AT (just to refresh your memory). Finally, you start to walk across the giant plaza with the building hanging over you and somewhere from the back of your head, you think "that's no moon, it's a space station" and you start to hum "The Imperial March." That said, the museum is pretty neat. After catching some lunch at a noodle place (I got coupons if anyone is interested), we met up with Takemi and Kumiko and the rest of the gang in Akihabara. Akihabara Electric Town is well-known as the place to go to get all the latest electronics and computer stuff. 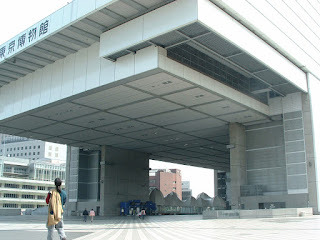 It's also well-known for anime otaku culture. 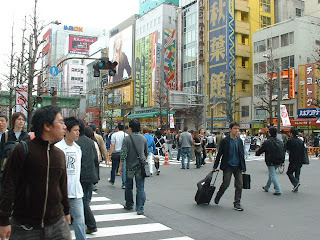 On the weekends (or maybe just Sunday), they close off the street and turn it into a pedestrian mall. Somewhere in that crowd are a couple of men dressed as cutesy female anime characters. 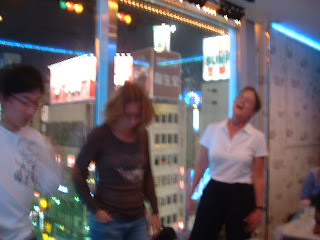 We stopped at a store (after a quick spin through a pachinko parlor). 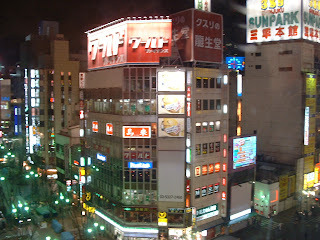 The top-floor was devoted to selling maid outfits. It also featured a maid cafe (waitresses dress up in little maid outfits and act the part) and a partitioned area where you could pay to take pictures of scantily clad young women. Classy. After Akihabara, we hit Omotesando Hills (by hitting Roppongi Hills, Omotesando Hills, and Tokyo Midtown, my friend Meg remarked, we were going to all the trendy Tokyo shopping complexes) and then some souvenir shopping. After all this walking around, clearly we needed a drink. 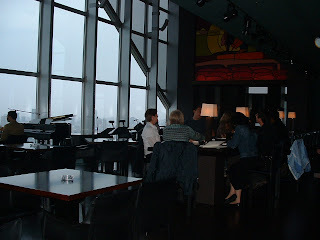 So here we are at the Park Hyatt, at the bar featured in the movie Lost in Translation (here's a still from the movie for comparison). After, we had a very nice dinner at an all-you-can-drink (for two hours, off the drink menu) place, where we sang "Happy Birthday" twice: once to Katie and once to a fellow diner as we were heading out the door. We capped off the day with karaoke. Here's the view out of our room. I'll spare you pictures of actual singing.